Hello Readers! We’re back with our weekly Friday blog post, and it’s another “compare and contrast” type of post. We read all the nice comments that you leave on our social media posts and we’ve noticed that a lot of you really enjoy the product information blog posts so here we are with another one! When it comes to the Shell chairs, there’s no doubt that the number of colors that have been released over time is astonishing. 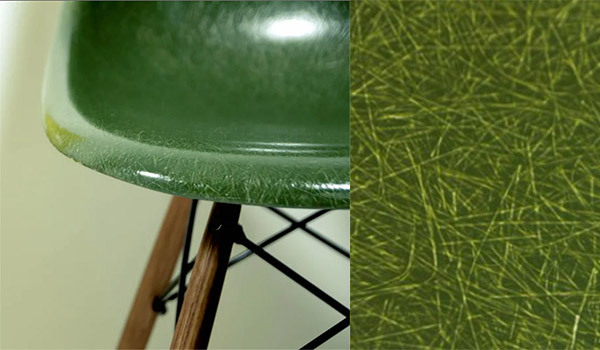 But to narrow it down further, out of every color that has been released from the fiberglass shell seating, the range of Greens is the color with the most variety. Although each color is unique in its own way, there’s often misinterpretations with some of the greens and the variety of greens just generally leave a lot of room open for discussion. So for this week's blog post, we’ll talk about the shell color, ‘Green’. So the question arises of how many different types of Greens actually are there? What could be categorized as ‘Green’? There are a few types of Green which you would look at and easily categorize as ‘Green’, but there are a number of slightly more Browner and Greyish colors that could also fit into the spectrum of Green. Below is a strip of each of the Greens in a particular order to make it easier for you to distinguish the differences in tone and contrast. The Sea Foam shell is one of the most if not the most popular shells out of all the shells, as well as the ranges of Greens, due to it’s color. However, they are not the rarest. The original Sea Foam green was released in 1950 and was produced through till 1967. But by the end of the 1950s, the sea Foam Light was in distribution. In 1960 Sea Foam light was only a commercial color for purchases of 200 or more pieces for commercial installation. But what are the differences between Sea Foam green and Sea Foam Green Light? From 1959 throughout till 1971, the range of shell colors expanded and this is when the sea Foam light was created. But in today’s secondary market, people don’t recognize the differences and it’s understandable. 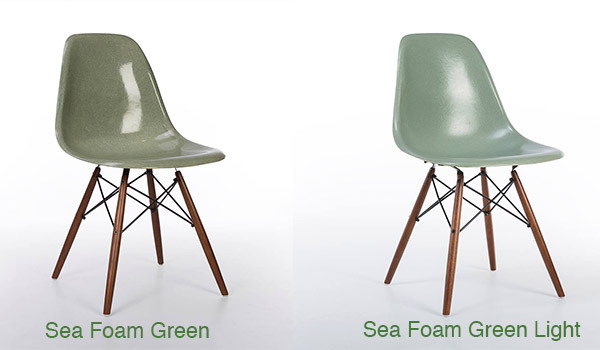 However, it’s important to distinguish between the two when it comes to selling your Eames shell chair, because it’s easy to make the error of listing the chair(s) as a ‘Sea Foam Green’ when in fact it is a ‘Sea Foam Green Light’. There is definitely a slight difference in shade between the two, but unless they are side by side, it can be difficult to tell them apart. The Kelly Green colored shell was released between 1959 - 1967 and this is usually a favorite. The rarity and desirability are really high and that’s most likely due to the almost forest-like color. That’s probably the reason why often the ‘Kelly Green’ shell is misinterpreted as the ‘Forest Green’ when in fact from the range of shells, there has not yet been a color that has been categorized as the ‘Forest Green’. With very high desirability, we just cannot do a blog post about Green shell colors without giving the Cadmium Green its own section. 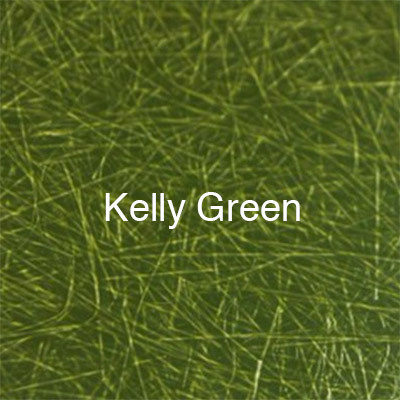 This color is often mistaken with the Kelly Green that we just mentioned. However, from the comparisons of the two colors, you can definitely see clear differences. 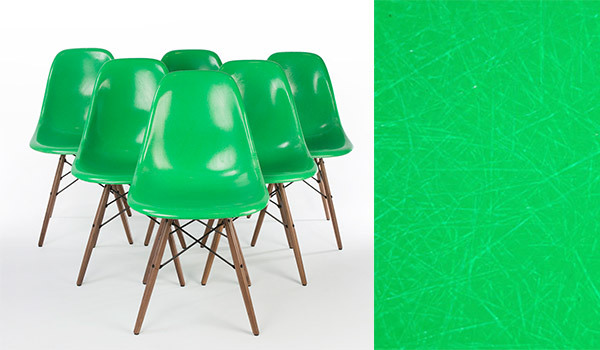 In addition to this, the modern-day relaunch in 2013, Herman Miller released brighter, more prime type of colors. As a result, the newer Fiberglass shells were created where the Green represents the Cadmium Green, but the intent wasn’t to copy. There are a number of colors that could be classed as ‘Green’ due to the Green hue within them. For example, The Raw Umber looks more greyish but in fact, it’s a close relative to the Seafoam and is actually classed as Green. The Khaki would also be categorized a Green. But although you may think that these colors are less vibrant as the alternative Greens you may have seen on the Fiberglass Shells, the Olive green just proves that the Green shells can still look just as good, even when they may not be the as bright as the Cadmium or as bright as the Lime Green that was released as a custom made color. This, in turn, makes it very rare and desirable. But going back to the Olive Green, this is the darkest green out of all the shades. A few weeks ago, we released a blog post about Shell colors and how to access the information about the different colors and how to use that as a tool when it comes to selling your piece. In addition to this, our Wiki provides a brief description into every shell color that has once been distributed, but also it takes you through every single Green that we have talked about in this blog post. So head over to our blog post about Shell Colors or to our Wiki for information about the different Colors. And there you have it, the key information you need to know about the differences in the color ‘Green’ for shells. We hope you enjoyed this weeks blog post and if you have any following questions about the colors or anything else, feel free to message us on any of our social media platforms!